Picture: windmills on the Kruisvest . 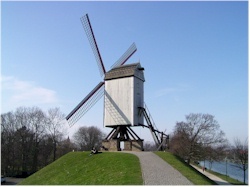 Bruges has a rich history of mills. When the second walls were erected around the town (end of 13th century); spots were foreseen where mills were built. Maps of the 16th century show that there were no less than 23 windmills on the townwalls. Between the Kruispoort and the Dampoort, where the remaining mills are nowadays, there were eight. Bonne Chiere. This mill originally comes from the village of Olsene, where it was built in 1844. The mill was rebuilt at its current location in 1911 as a replacement for the the old Bonne Chieremill that was blown down in a storm in 1903. It is used as decoration and never served for grinding grain. It's the mill that is standing closest to the Kruispoort. Type: wooden standardmill on four brick dice. Not accessible for the public. Sint-Janshuysmill. This is the only one of the four mills that has always been on this place. It was commissioned by the bakers of Bruges and constructed on this place in 1770. It stands on the place where there used to be another mill of the Saint-John's hospital (which was blown down in 1744). Type: wooden standardmill on four brick dice. Accessible for the public and arranged as a museum. Nieuwe Papegaai. 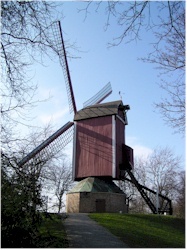 Initially called the "Hoge Seinemolen", this mill comes from the village of Beveren-aan-de-IJzer where it was erected in 1790 as an oilmill. In 1970 it was moved to its current place in Bruges and renamed the "Nieuwe Papegaai" (the "New Parrot"). It can be clearly be recognized by the parrot that is placed on the roof and serves as weather vane. Type: wooden standardmill on a closed brick base. Not accessible for the public. Koeleweimill. This mill, which name can also be written as "Coelewey", is the one closest to the Dampoort. 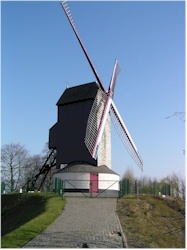 It's a cornmill from the community of Meulebeke where it was known as the "Bosterhoutmolen". The mill was built in 1765 and broken down in 1980 for the construction of a road. 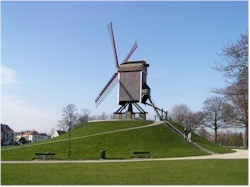 The town of Bruges bought the pieces and reconstructed the mill on its current place. The new name refers to one of its predecessors that was called "Coele Wint". Type: wooden starndardmill on a closed brick base. Accessible for the public.